A Bryde's whale nearly swallows diver (circled) as it feeds on anchovies. 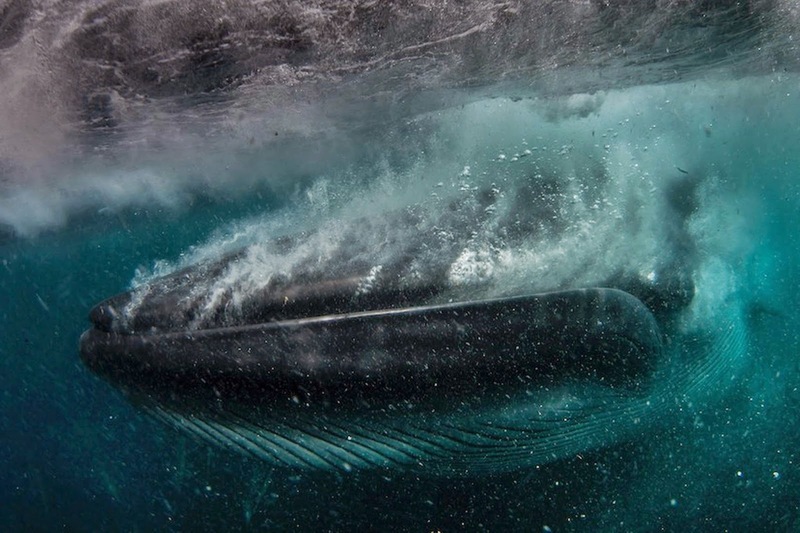 Diver Rainer Schimpf was documenting the sardine run off the coast of Port Elizabeth, South Africa, when he was very nearly swallowed by a 49-foot, 40-ton Bryde’s whale. Sharks, dolphins and birds were feeding on the sardines when the Bryde’s whale decided to get its fill of food, too, rising to the surface with mouth agape trying to capture a ball of bait. Schimpf was only feet away. “Luckily the giant mammal swerved at the last moment to avoid smacking directly into him, but it still sent him flying as it breached,” Barcroft Media reported on its YouTube post. A Bryde's whale with a mouthful of anchovies. A Bryde’s whale feeds on wide variety of fish, planktonic crustaceans and cephalopods. Off South Africa, a Bryde’s whale prey preferences differ between the inshore and offshore form. They mainly feed on anchovies, as this video portrays. They don’t typically feed on humans, thankfully for Rainer Schimpf.